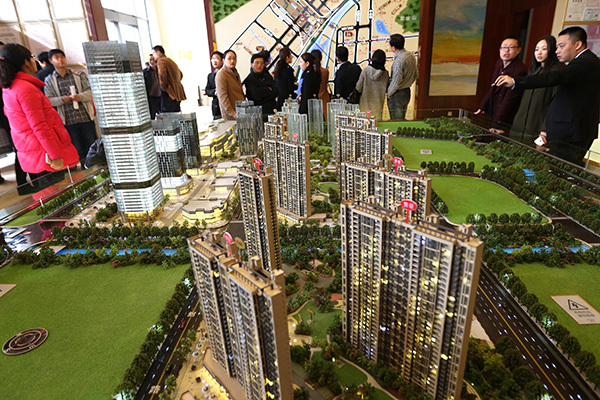 Shenzhen – Hong Kong and foreign enterprises operating in the Qianhai special economic zone have expressed concern over Shenzhen’s high property prices and entrepreneurs’ ability to integrate with the mainland market. But, they acknowledge that Qianhai’s preferential policies and open environment have made the zone an ideal place for businesses from Hong Kong and abroad to tap into the mainland market. “From the aspect of government administration and environment, Shenzhen, I believe, is the best place to set up business in the country, and Qianhai is the best area in Shenzhen,” said Peter Fuhrman, chairman and chief executive officer of China First Capital, an investment bank. “However, from the aspect of cost, it’s not the best. Soaring property prices in the city have increased costs for businesses, and there needs to be a solution,” the US entrepreneur said. Wednesday marked the first anniversary of Shenzhen’s Qianhai and Shekou zones coming into operation as part of the China (Guangdong) Pilot Free Trade Zone, which also includes Zhuhai’s Hengqin and Guangzhou’s Nansha districts. As of April 15, more than 91,000 enterprises had been registered in the zone, with registered capital amounting to 4 trillion yuan ($616 billion). Among them, over 3,100 were Hong Kong-funded enterprises, which contributed nearly one-third of the zone’s tax revenue. “Qianhai will continue to focus on cross-border cooperation between Shenzhen and Hong Kong, and strive to create a platform to support Hong Kong’s stability and prosperity,” Tian Fu, director of the administrative committee of Qianhai and Shekou, said at a ceremony marking the first anniversary on Wednesday. Innovation and entrepreneurship are among the key areas of cross-border cooperation. To attract Hong Kong entrepreneurs to set up business across the border, the Qianhai Shenzhen-Hong Kong Youth Innovation and Entrepreneur Hub (E Hub) was launched, providing tax incentives, funding opportunities and free accommodation to Hong Kong entrepreneurs. As a result, more and more startups from the SAR are setting up offices in the E Hub. Many of the companies have been doing well, Fung said, while noting that some have not made much progress so far. Fung said when Hong Kong entrepreneurs start operating on the mainland, it’s necessary that mentors are provided to help them, as environment, laws and policies between Shenzhen and Hong Kong are different. She also urged the authorities to provide more support to help Hong Kong startups find investors. Where did you spend Christmas? Mine was spent in temperatures reaching 38-below zero on the frozen lakes and grasslands of Northeastern China. I was there to give a speech on Christmas Day at a conference in Manzhouli on Russian, Chinese and Mongolian economic integration. Manzhouli is a Chinese city but with a unique pedigree and location. First settled around 1900 by the Russians building the Trans-Manchurian spur of the Trans-Siberian Railway, it was then conquered by the Japanese before China took control after World War Two. It sits at the single point on the map where the borders of China, Russia and Mongolia all converge. Manzhouli’s train and road border crossing between Russia and China is the busiest inland port in China, with most of China’s $50 billion in annual exports to Russia passing through here. China, Russia and Mongolia are now partners in China’s ambitious new strategic trade initiative known as “One Belt, One Road“, or OBOR, as well as the Chinese-sponsored Asia Infrastructure Investment Bank. The conference was meant to encourage closer trade ties among the three. OBOR is designed in part to redirect China’s investment focus away from more developed countries, especially those participating in the US-led Trans-Pacific Partnership. China’s exclusion from TPP is perhaps the biggest single economic policy setback for China in the last decade. The TPP countries include most of China’s key trading partners. If enacted, TPP will cause trade and investment flows to shift away from China especially towards Vietnam, Malaysia and Philippines. The three are all parties to the TPP agreement, and so will benefit from preferential tariffs. All have aspirations to take market share away from China as a global manufacturing center. TPP will grant them a significant long-term cost and market-access advantages. OBOR is a consolation prize of China’s own construction. The countries inside the OBOR plan look more like a cast of economic misfits, not dynamic free traders like the TPP nations and China itself. I don’t believe anyone in Beijing policy-making circles believes that increased trading with OBOR nations Pakistan, Myanmar and the Central Asian -stans is a credible substitute. China’s best option is to find a way to persuade TPP countries to allow it to enter the group. There’s not even a remote sign of this happening. China was excluded from TPP by design. China does not live in a particularly desirable or affluent neighborhood. It shares land borders with fourteen countries. Of these, Russia is by far and away the richest of these countries. Mongolia, with its three million inhabitants most of whom still live in yurts as nomadic herdsmen, ranks third. This gives some sense of how poor many of the places that are now the focus of China’s OBOR are. Another key component of OBOR, but one often overlooked, is to open up new markets to the most troubled part of China’s industrial economy, the manufacturers of basic products like steel, aluminum, basic machinery and chemicals, turbines, cars, trucks, trains. They all are suffering from acute overcapacity with vanishing profit margins up and down the supply chain. The Chinese leadership recently announced that dealing with overcapacity in China will be one of its major economic policy priorities for 2016. The problems are most severe among state-owned industrial conglomerates. The Chinese government is their controlling shareholder. Two obvious solutions — shrinking capacity and cutting employment — are, for the time being at least, politically off limits. OBOR is meant to be a lifeline. China itself cannot absorb this excess domestic capacity. Demand for basic industrial products is already evaporating, never to return, China is already well along in the transition to a service economy. China will pay or lend tens of billions of dollars to poorer OBOR countries to finance their imports of Chinese capital goods. The trade won’t likely be very profitable but it will keep jobs and revenues from deteriorating even more sharply. You may download the seven-page English-language talking points, map and charts from my speech by clicking here. At night, there was a banquet for political leaders from the three countries. Afterward, a beauty contest was staged, featuring Chinese, Russian and Mongolian contestants in bikinis and evening gowns. You can see photos here, including ones of me with the Chinese winner and the nine Mongolian contestants. An ice fishing expedition was also organized. If OBOR does achieve its goal by drawing Russia and Mongolia into a closer economic relationship with China, Manzhouli stands to benefit more than anywhere else in China. As if in readiness, Manzhouli storefronts are in Chinese and Cyrillic, the new airport terminal is in the Russian style, and the main park in the city lorded over by a 10-story Matryoshka doll. For now, though, no one is seeing much sign of OBOR stimulating greater trade. The main focus for investment in Manzhouli is in tourism facilities to attract Chinese summer vacationers to the surrounding grasslands, China’s finest. This time of year, the cement tourist yurts are empty and the long-haired riding ponies are left to graze and amble in the arctic wind and snow. It is the world’s most watched nightly news report, China’s CCTV 7pm evening news program, “Xinwen Lianbo” (新闻联播）. Simultaneously broadcast on most terrestrial tv stations in China, it has a nightly audience estimated at over 100 million. This past week, the level of broadcast Chinese on this news program took a brief, steep dive. The reason: a short clip of me speaking Chinese led off a news report about recent economic reforms in Guangdong Province and the introduction of pilot free trade zones in Guangdong‘s three largest cities, Shenzhen, Guangzhou and Zhuhai. You can watch the video by clicking here. (You may need to sit through a pre-roll advertisement.) My contribution is mentioning how comparatively easy it is to register a business in Shenzhen Qianhai, the most ambitious of Guangdong’s free trade zones. I was out of the country in Europe when the broadcast was aired, so didn’t get to watch it live. But, I knew instantly something was going on. As I sat in a lunch meeting in Switzerland at 1:15pm (7:15pm China time), calls and messages started flooding in from friends and acquaintances watching the report in China.